As the CEO of a pharmaceutical company, which is more important: making the company as financially successful as it could be or ensuring that its life-saving products are as high-quality and accessible to as many people as possible? It’s a question whose ethical and business implications have been debated endlessly in the news, most recently in relation to Mylan’s alleged Epi-Pen price gauging. Where it is less often discussed, however, is in the classroom, where business students absorb and hone the skills they’ll need to thrive in the marketplace. 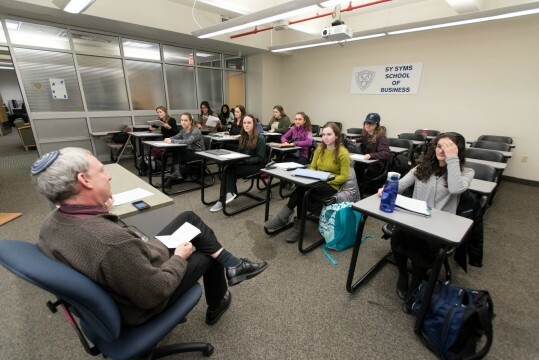 A new class at Yeshiva University’s Sy Syms School of Business seeks to equip students to grapple with the moral and ethical dilemmas they will face as leaders in the business world by training them to consider what their responses to these kinds of value clashes might be before they arise in their own lives. 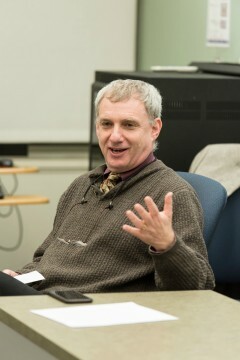 Called Business as a Human Enterprise, the Sy Syms Honors Program course—taught by Dr. Moses Pava, dean of Sy Syms—explores concepts like the purposes of modern corporations, corporate social responsibility and accountability in an increasingly connected world, and how to develop a realistic approach to the business environment without succumbing to cynicism. Sy Syms School of Business Dean Moses Pava, bottom left, teaches Business as a Human Enterprise on the Israel Heny Beren and Wilf Campuses. To that end, the course includes a focus on how to identify and choose actions consistent with a set of values, as well as how decisions in what Pava calls “defining moments” help shape a person’s moral and ethical character through the analysis of real-world case studies. One famous example the course studies is the actions of former Malden Mills CEO Aaron Feuerstein ’47YC following a catastrophic 1995 fire that destroyed his factory. Rather than moving the company overseas, Feuerstein chose to rebuild the factory in Malden Mills and continue to pay his employees their full salaries. The move, while lauded by many as heroic, cost Feuerstein $25 million as well as his position as CEO, and led the company to file for bankruptcy just six years later. Students in the course have to decide how they would steer an organization at an ethical crossroads. In the course, students envision and walk through their own defining moments to simulate how they might navigate a crisis in the driver’s seat of an organization. Pava conceived the idea for the course after attending the Aspen Undergraduate Business Education Consortium, whose goal in part is to explore new avenues of integrating liberal arts and business studies. 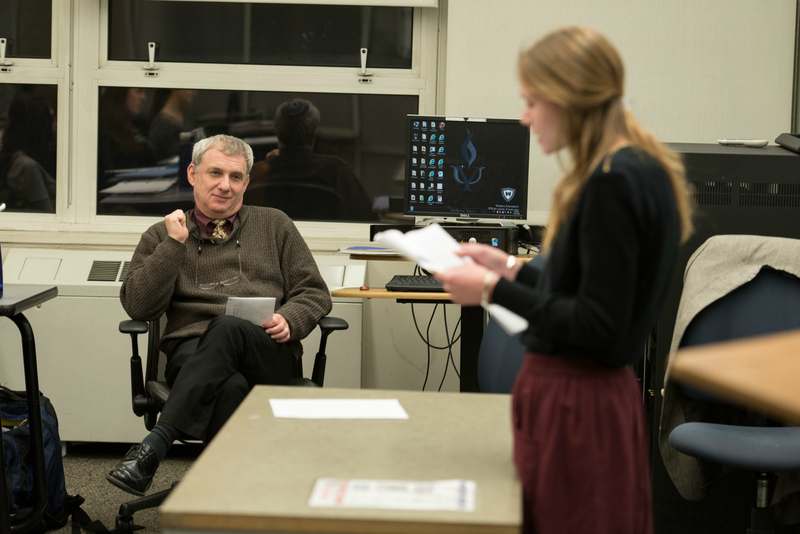 His class is taught in a blended format on both the Wilf and Israel Henry Beren Campus, with students viewing lectures online and meeting in-person once a week, which gives Pava the opportunity to incorporate their questions and feedback into the class as it moves forward. 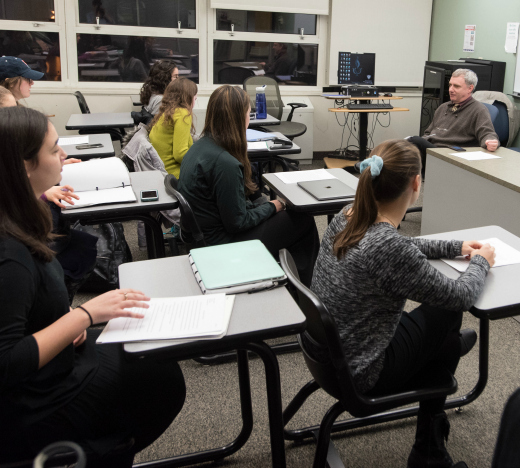 For Leah Feygel, a senior majoring in finance, one of the course’s most powerful messages was that there is no one-size-fits-all approach to living an ethical life in the workplace—in fact, there’s no universal definition of what an “ethical life” even describes.